Not only is Suwannee a great place to fish, but it’s also a great place to eat. 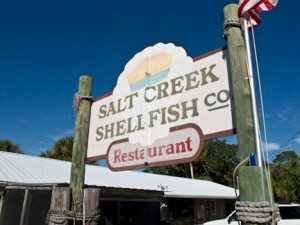 For breakfast, try Sarah’s and for lunch or dinner, go to Salt Creek Shellfish Company (352) 542-7072. 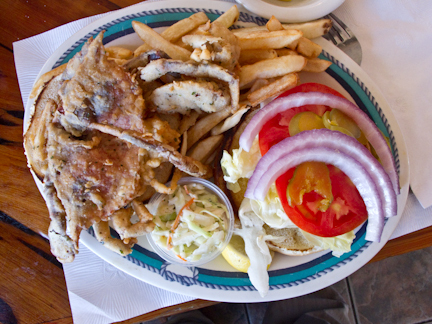 On a recent trip to Salt Creek, I had the soft-shell crab sandwich for lunch and a wonderful stuffed (with crab, scallops and shrimp and cream cheese) grouper entree. Lots of other choices, too. Depending on what’s available fresh, the seafood menu at Salt Creek and Sarah’s changes daily. Soft-shell crab sandwich at Salt Creek Seafood Co. in Suwannee FL. A tasty treat! Fishing at Suwannee is excellent, and there are two full-service marinas (Miller’s and Suwannee Marina) as well as Bill’s Fish Camp. All have ramps on the ‘river’ or ‘freshwater’ side of town, but it’s not hard to head around to Salt Creek, fish the bars, and dock for lunch at Salt Creek Shellfish Company.